As real growth is absent in the economies of the Global West, both central bankers and politicians both are searching for ways to get growth back in place. As the loan/credit capacity of many governments of the Global West is near/over its top, governments can't loan that much more to stimulate the economy. The next station is named QE. QE as abbreviation of Quantitative Easing is a polite term for watering down the value of a currency by artificial creating more money in circulation by just what keyboard strokes in the account database of a central bank while the economy is not growing by that one minute action. The QE as done since 2007 in the Western World was not about real economic growth, but was a replacement for real economic growth. The only growth it delivered was a further growth of the (before that QE already too much of GDP consuming) financial sector. Central bankers have their own monetary reasons to consider QE. This sounds irrational as at first sight central bankers don't like QE that much (as their primary objective is price stabilty and Financial QE and price stability are contrary facets). These reasons are strangely enough not in heavy political pressure (as many people think on first sight: governments that run out of funding with economies that decline scream for QE of course), but are mainly/initial found in their second main objective: maintaining the stability of the financial system. What have the stability of the financial system and QE in common i.e. what has QE to do with it? The current design of our financial system just needs endless growth to not implode. Why? Because the current financial system creates money for the loan principal, but the money for interest payments should come from or growth. If growth is absent there will be with mathematically certainty defaults (unless some kind of QE is applied). When growth stalls, money creation should kick in, otherwise defaults are mathematically certain: this is no politics, but just monetary mathematics in/by/due a monetary system that has growth as core facet in its design. The two core objectives of any central bank are a) price stability and b) financial system stability. In QE those two objectives are severely conflicting: delivering a situation with two strong polarized fractions/visions/directions in each (non-US) central bank. For the US central bank the playing field is quite different: as they operate the global reserve currency, they can have the upside of QE, without the downside of QE. This is something people like Krugman don't understand: the total different playing field of the FRB and the ECB. That most politicians are in favor of QE should not come as a surprise: creating money without taxation is a long time dream of most politicians. Certainly in dire straits this option shines like bright stars for them. Getting 'more' economy again, 'solving' the problems in the financial system: all sounds very good to them. Most politicians have a less shortened view/perspective on this than central bankers, and politicians also often have a psyche that is professional shaped/blinded for possible downsides on their wishes/policies. Is the concept of QE too good to be true? In Germany they see it that way. Not out of theory, but out of painful practice. They used QE to the max in the early 20ties of the last century to solve other problems (the huge WWI compensation payments forced on them by UK and FR that could not be paid out of the normal national economic performance). Germany understands that QE is no tool to fix other problems. It destroyed what was still standing in the economy. It washed out all the savings and pensions of the middle class. It made the problems more worse than before. As after the debacle of the Weimar Republic it all went down hill / south / worse for Germany (and by that for Europe and the whole world at large). 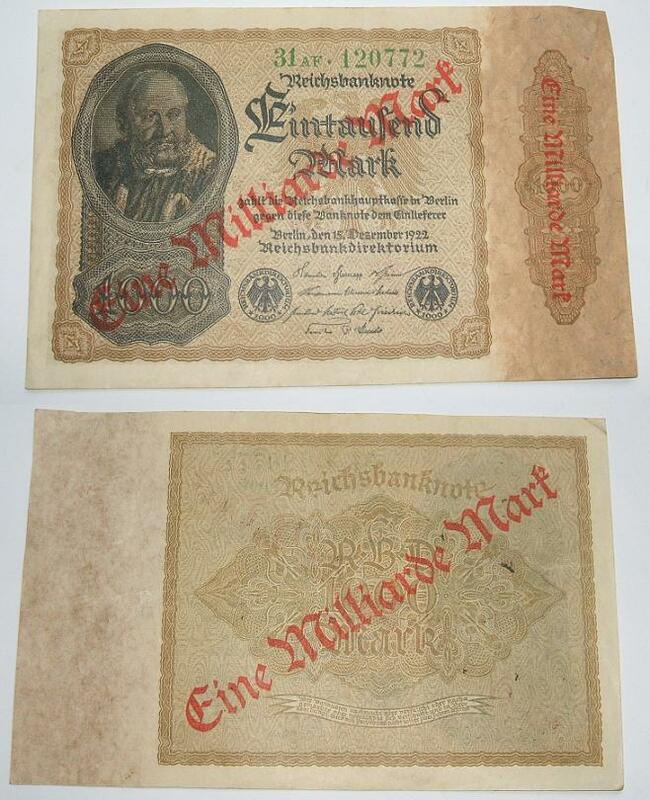 See http://www.planck.org/images/German-1923-Weimar-Republic-Hyper-Inflation--One-Billion-Mark-Note.jpg for a photo of both sides of a billion reichsmark banknote as proof of this collapse back than. Something that should be mentioned/understood first (before going deeper into the subject of QE) is the current process of money creation. More than 90% of the money creation takes place by commercial banks when they issue loans. The money comes into existence after the loan contract is signed and seized to exist when the loan is paid off by its amortization payments. This is something not that many people know. Take notice that the money for the interest payments is not created, that should come from other sources (or growth or QE, there are no other flavors in this). Why can banks still go broke if they can create money themselves? Banks go broke when the are not able to honor the interbanking obligations (payments to other banks). Delivering the mandate of money creation away from the state to the commercial banks is something that only the last years has entered the discussion area. Why? As banks always said 'we are not that crazy as governments: we don't use the power of money creation to go to war like states do', but since 2008 (or since they 'got drunk': a quote of G.W. Bush) this 'the process of money creation is don better in hands of the banks' dogma is very much under scrutiny. Wages of north of $ 200 million a year and yearly bonus carnivals for everybody within the banks undermined this dogma somewhat, but needing governmental budgets to survive delivered a paradigmatic change to this discussion. Another thing that should be mentioned/understood too first (before going deeper into the subject of QE) is the phenomenon of a 'global reserve currency'. The nation who is the owner/operator of that (most wanted/used in international transactions) currency has a headstart/advantage on/above all other nations. As that nation could do QE without the nasty consequences other nations would experience is they did the same. Due to the demand of that global reserve currency the issuing nation can create money without any negative consequence for the state or the central bank. On the contrary: it delivers them more global leverage. Both as nation (economic and military) and as currency. Having the global reserve currency is like having a soft global empire with an invisible taxation on almost all global production. The US was able to push the dollar as such in 1944 (successfully lobbying against the basket model at the Bretton Woods monetary conference). The US was able to renew this headstart/advantage situation in 1973 (after the unilateral abolishing of the terms of Bretton Woods in 1971) by signing the so called 'petro dollar' agreements with Saudi Arabia. Operating a global reserve currency made it possible for the US to run an economic model that is for 75% (instead of for the normal balanced 50%) based on consumption. Operating a global reserve currency made it possible for the US to buy their own federal state debt, to support their own financial markets/exchanges with purchases. Its a very powerful tool every other nation of course envies. Let's go back to QE as subject. Let's assess it first with no judgement before having done intensive research into it. First we need to analyse what QE is, than we need to analyse what types of QE are possible, than we need to analyse what the consequences of each of those types are. Only than we can draw some educated conclusions. QE is money creation by the central bank instead of by the commercial banks. All other definitions are not scientific, even the one at Wikipedia (http://en.wikipedia.org/wiki/Quantitative_easing), as longer definitions also describe the way it's implemented in the definition, narrowing and flavouring it. This can be seen to in the current media/financialindustry/public perception of QE, which has a somewhat limited time driven window. The mainstream perception of QE is the one that filled the newspapers since 2007 and is the Financial QE version: the one that's about buying financial paper like governmental debt (governments happy: budgets saved) and bank debt (banks happy: their garbage/losses/risks sold with profit). But this has not always be the perception. But Financial QE is just one version of QE. There is another (total unknown) version of QE too: Productive QE. And those two works/operate quite contrary to each other. Financial QE is based on the concept of 'trickling down'. The problem with this model is that very little trickles down from 'Wallstreet' to 'Mainstreet'. As distribution method Financial QE has failed to perform severely. Why? It's giving the banks a load of money and let them decide what to do with it. Do the math. Not surprisingly are the results therefore not quite what was planned/expected (that the QE money would reach 'Mainstreet': as in: the real economy of the QE delivering nation). Financial QE has proved mainly to lead to carry trade (capital export by loans to high-risk/high-interest destinations) and thereby has just passes and thereby has no effect on the local/regional/national economies. This increases the risks of the financial system even more. Another unwanted Financial QE attached consequence is that someone/somewhere in field between the governments and the central bank picks the winners and the losers. That's not a good concept as that ruins the concept of having a fair equal playing field. As a consequence of this one bank will be saved and another not. Financial QE delivers no transparency at all. This is why it can no longer be defended in a time where worldwide transparency has become a huge facet in accountability. Financial QE says: trust us, we'll the right thing. That worked before 2007. But was instant over when the banks need to be saved by taxpayers money and taxpayers guaranteed governmental lend money. The envelope is pushed to far and the consequence is instant lack of trust and instant demand of transparency. Another unwanted Financial QE attached consequence is that it has made the 'too big to fail' financial institutions even bigger. CEOs of these mammoth size institutions are not capable to manage these too large vehicles. Big is a neutral facet. Too big to manage isn't. Too big to audit too. This not being able to manage nor audit issues increase the risks of the financial system even more. Another unwanted Financial QE attached consequence is that Financial QE also punishes savings (low interest rates) and honours debt (low interest rates). Economies, governments, businesses and households that give up care for the future (by stimulating debt and punishing/undermining savings/pensions) behave like deep addicted gamblers. Living today to/over the max and don't care about tomorrow is not a too wise concept. Certainly not in a time that governmental social safety nets, health care funding and elder care funding are all in decline. One of the worst consequences of Financial QE is that it enlarges the (let's be honest: parasitical) grip of the financial economy on and at the cost of the real economy. A financial sector of 2 to 3 % of GDP thrives an economy. Any bigger size of the financial industry makes it parasitical on the real economy. Another worst consequences of Financial QE is Financial QE only/just facilitates both banks and governments to continue in doing what they already doing: burdening the real economy beyond wise levels. Financial QE has a severe policy/goal deficiency. Financial QE has delivered on non of the promises that are used to defend/implement it. Productive QE is based on the concept of 'percolating up'. The banks can get QE money of the central banks under conditions. While Financial QE gives the banks a free hand in spending the QE money, Productive QE directs/channels the money creation within the banks in the directions wanted and with open transparent control mechanisms. How? By legislation? No. By the percolating up model. Only money lend out in certain directions under certain conditions can be acquired by the central bank or a by the central bank for a special sector/function/model initiated SPV. Is Productive QE about over-regulation, about a further going socialistic/statedriven model that phase out the cleaning influence of the market? No. On the contrary. It delivers all private parties (banks and others) in non-discriminatory way very easy tools to get turnover/margin by delivering those things to the economy that are wanted by all in a non-discriminatory way. It facilitates the banks to perform in ways we all want. It gives them all the freedom they want, but if they want to have benefit of public created money they only can have that in public wanted ways. What things we all agree on? That are investments (so not operation/costs, but investments/facilities) in energy, food, water, roads, bridges, rails, health care, ships, planes, airports, harbours and of course export. Productive QE focuses on those investments: making sure the QE money is spend in investments in those areas/sectors. But these sector limits are just an overview. Not any investment in these sectors can be securitized for cash in the Productive QE model. As the Productive QE than would be abused almost as much as Financial QE. Productive QE is using QE created money for a) certain sectors and b) under certain conditions. The conditions create a) an open fair playing field, b) protection against abuse, c) auditing possibilities and d) full transparency. So it's not about helicoptering some or loads of money by the banks into certain sectors. It's about analysis what's needed, how it can be deployed to the good of everybody/anybody, how it can be abused (and preventing this). So it's about making models that will take some more days than the 1 day that Hank Paulson took to decide on the first QE operation in 2008. It wants to have effect in the real economy, so it has to be more well thought and more worked out. It wants to be accountable and auditable and is therefore transparent is all it's actions by open/accessible databases. Transparency delivers trust. Energy - Let's take an easy example to explain Productive QE in practice/action: Energy. We all agree that energy is a basic need for a nation, an economy, corporations, businesses and households. We all agree that importing energy is monetary drain (for energy exporting countries: using/burning instead of exporting). Solar energy could deliver fuel less energy. Solar energy could deliver less pressure on the grid. Solar energy investments that deliver power at cheaper than current grid costs (only than the discussion on solar is over) helps an economy further. All nice facets. So let's do it. Any business or household that installs solar on their roofs could apply for such an EQE (Energy Quantitative Easing) loan by their own bank or by their own supplier. So an open and fair playing field for everybody (any business, any household, any supplier, any retailer, any manufacturer and any bank). So no repeat of the Solyndra special relations feed/created debacle, where the government chose a 'winner' (that turned out to be a loser after all), regardless the not that nice campaign contribution issue. No funding of risky plant investments (that's more a venture capital issue), just funding of deployment/installation investments. The only thing that's needed is just some (digital) forms that ensures a) that the product is delivered, b) that the product is installed, c) that the product is delivering, d) that the product is ensured and e) that the product is financed. The banks could securitize these loans in an on balance (!) way (they will not like the on balance facet, but they just have to live with that) in a 80% funding agreement (making sure that the bank holds enough equity) and with full equity risk for them of the 20% not financed part. All this data will be publicly available in an open database. So cooking the books on this will become very difficult. Each bank could securitize these solar loans by a by the central bank initiated SPV entity. An entity which operates the model, the database and the control (but every citizen also could control the data concerning themselves and their environment). There are several other potential Productive QE models that could be realized in the energy realm, but they will be more in the field energy saving/conservation (and therefore also automatically delivering a good ROI too). Double or triple glazing for buildings (houses, offices, etc) for nations that have climates with winters is a good one. High efficient heaters for nations that have climates with winters is also a good one. Those type of investments are decentral and earn themselves very easily back for those who do them: those two characteristics make them to good Productive QE money funded securitization SPV potential: serving Mainstreet by saving them money and serving economies by production and installation activities and serving monetary systems by delivering low risk backing, low risk further repayments and stopping the monetary drain that energy imports are. Will there by such an entity for wind energy? No. Wind energy needs subsidizing from the states for exploitation. Anything that needs subsidies is not suitable for Productive QE. Wind energy will not be done so long it's more expensive than current grid power prices, so it needs subsidies to operate profitable. Solar energy investments removes pressure of the grid. Wind energy investments give peak pressures on the grid. Wind energy operators also don't like the full exposure of the market: they always hide in the less windy realm that they seek by very/too close governmental contacts (as in: they tend to like 'revolving door politics' (a polite term for 'white-collar' 'corruption'). By these three facets (among others) there's no public wide support for wind energy and therefore it doesn't met the Productive QE requirements. As long those three are not changed (and they will never) wind energy is a political issue not everybody supports and therefore will not be addressed by a Productive QE money funded securitization SPV. To be more clear: Productive QE is about investments reaching Mainstreet, about decentralization, about a percolating up model, wind energy investments don't meet this crucial Productive QE demands. Will there by such an entity for nuclear energy? No. Nuclear energy needs subsidizing from the states for exploitation. Anything that needs subsidies is not suitable for Productive QE. Nuclear energy will not be done so long it's total costs are more expensive than grid power prices (total costs are: investment, fuel, spend fuel storage for ever, insurance and grid adjustments), so it needs subsidies/guarantees to operate profitable. Solar energy investments removes pressure of the grid. Nuclear energy investment demands new power investments. Nuclear energy operators also don't like the full exposure of the market: they always hide in the less windy realm that they seek by very/too close governmental contacts (as in: they tend to like 'revolving door politics' (a polite term for 'white-collar' 'corruption'). By these three facets (among others) there's no public wide support for nuclear energy and therefore it doesn't met the Productive QE requirements. As long those three are not changed (and they will never) nuclear energy is a political issue not everybody supports and therefore will not be addressed by an QE money funded securitization SPV. To be more clear: Productive QE is about investments reaching Mainstreet, about decentralization, about a percolating up model, nuclear energy investments don't meet this crucial Productive QE demands. So energy focused Productive QE can be perfectly done in a 'percolating up' model and serves the national economies from their roots up: it saves companies and households money, makes economies less vulnerable due less energy import needs, supports monetary health as it stops/reduces energy imports from abroad that are a monetary and therefore also wealth drain everywhere they are needed, delivers national economies jobs and technological improvement, delivers banks the turnovers and margins they need to adjust to their new realities with out collapsing or need of governmental support. And the nicest thing of energy investments over for example real estate investments: energy can be transported when local markets change, real estate can't. Trade - Another very clear and effective example of Productive QE is financing export. The model is called TQE: Trade Quantitative Easing. It's about funding of export transactions during their (on board) travel time. TQE makes export financial much more easier as the manufacturer/producer get the invested capital the day the product is shipped. Any financial than could deliver this service to everybody. Of course it's limited/restricted/structured to prevent abuse. The flow of goods and the contracts of the receivers are the collateral. So it's a distributed collateral model. Central banks could decide to apply TQE also on imports, but that will mostly done only in bilateral agreements with another central bank as counter partner for this. TQE boost the export capacity of a nation and by that its production and by that its economy and by that its monetary system. There's also bilateral version of TQE called BQE: Bilateral Quantitative Easing. TQE is BQE when two nations do TQE on their imports/exports. BQE is a limited/restricted/structured version of BCS (Bilateral Currency Swaps). Non limited/restricted/structured financial BCS will be used mainly by the financial industry (and therefore will not service the economies of both nations/regions that much). To make it limited/restricted/structured means that abuse of BCS arrangements is much more harder and has exclusion as penalty: this (TQE version of BCS) takes care that financials will not abuse the BSW arrangements. Politicians could support the function of these arrangements too by various policies. They should consider to open a consulate in every global metropolis (even if that was for cost reasons at the start just a 'laptop diplomat': one person, no office,). If this could be done bilateral (visa versa) that would even be more effective. They should consider to realize a national trade center in every global metropolis. This could be done at no costs by partnering with a local real estate company (mutual interests driven). If this could be done bilateral (visa versa) that would even be more effective. See http://www.worldclusters.com for more on this concept. They should activate the trade potential of their immigrant demographics. See http://www.planck.org/publications/Immigrants-And-Trade for more details on this attractive real economic growth policy. All these measures would team up with the (non-political, just monetary) TQE arrangements of the central bank. Infrastructure - Good infrastructure could thrive a nation's economy (and thereby its monetary health) severely. Financing it by IQE (Infrastructure Quantitative Easing) seems to be a good idea at first sight. But that's only at first sight as there's huge problems very easy to see when looking somewhat more into it. First: it's a non distributed (and therefore risk concentrated) model. Second: There's no direct income on the roads unless they are paid by toll. Third: Infrastructure is very interconnected with government decisions, so within infra realization corruption levels are very high. Fourth: The project prices are not fixed ever: they our mostly funded by blank cheques of the government. Fifth: Every city want intercity highways and rail roads to any other city nearby and connection to the national and continental highways and railways. And of course a new international airport and harbour nearby too. But most of these ambitions are economic nonsense/madness. A good sieve to prevent non-economic infrastructure investments could be if a municipal, state or federal government would fund 50% of the investment at front, but even than there are still two lose ends: a) project realization risks (and the effect of that on the height of the investment) and b) no income out of operation. The last could be cornered by toll revenues, but than privatization in combination with revolving door politics (http://en.wikipedia.org/wiki/Revolving_door_%28politics%29) would pollute the rational economic process once again severely. Revolving door politics makes these corporations lazy in competition/quality and the governments weak in control/legislation: as they together play a special interest game at the cost of the public interests. Tepco in Japan was a good example of these with in heinsight quite some consequences. Rail investments (where the infra is of the state or a state-owned entity and therefore public ownership) addresses addresses/corners this corporate/government merge problem better: a) intensive governmental debat leads to choices (delivers some rationality/transparency into the discussions and choices) and b) rail roads have an income model. Sweet water and ocean water pipelines are other examples that have not the burden/pollution of revolving door politics. There should be (rational/realistic/economic) caps on the infrastructure ambitions of every layer of government. As long those (once again: limited/restricted/structured and rational/realistic/economic) caps are not solid as a rock in place IQE is a bad idea that only will lead to rich contracting corporations that milk any government endless on multiple infrastructure projects. IQE is something that should not be done in developed countries with declining demographics/economies. IQE could be a good idea for developing nations, but only in non-corrupt environments and by wise governments. As those two are scare, using IQE for both roads and airports is maybe a bad idea. Water - Another very clear and effective example of a potential Productive QE realm is financing of limited/restricted/structured (rational/realistic/economic) water projects. There are several models in this water realm. SWIQE: Sweet Water Infrastructure Quantitative Easing. SWIQE is for example about realizing the pipeline investments to pipe the sweet water of the Great Lakes in the North of the USA (which have a water surplus) to the eastern and southern states of the USA. WWIQE: Waste Water Infrastructure Quantitative Easing. WWIQE is another example of such a possible Productive QE arrangement. Using Productive QE to construct (emerging nations) or refurbish/replace (developed world) sewage systems. Something not that well known is that most of the sewage infrastructure in developed world is very old and leaks fluids into the soil on numberless locations and by that infecting/polluting the precious/important ground water reserves. Also the old sewage model (concentrated both in water types as geographical) is outdated. New sewage models handles different water types in a different matter and also are much more decentral (even till just one neighbourhood servicing). In the WWIQE model there are debtors (users) that deliver the financial/amortization model for the investments made, so it meets the demands of Productive QE and Productive QE therefore could be certainly used for sewage investments. OWIQE: Ocean Water Infrastructure Quantitative Easing. OWIQE is about piping salt ocean water into the desert parts of continents to do a (rational/realistic/economic) combination of salt water loving crops agriculture and salt water aquaculture in this arid regions. FQE: Food Quantitative Easing. Food is just 'embedded water'. FQE makes Productive QE money available for farming / food production. Also here in a limited/restricted/structured way: preventing that large corporations will soak up all those budgets, making sure that the reach the family farmer. DQE: Desert Quantitative Easing. DQE delivers a whole set of Productive QE measures/arrangements that transforms deserts into productive areas based on the very low cost concept of adding seawater and doing salt water based agriculture/aquaculture and waterproduction/energyproduction. There are not that much investments that delivers such a monetary and economic boom for desert nations as DQE. More detailed information on this very powerful Productive QE model for deserts owning nations (as it eliminates their food/water/energy imports, diversifies/thrives their economies and makes their monetary health better than ever before) can be found at the site of DesertCorp (see http://www.desertcorp.com or the slide presentation of this model at http://www.desertcorp.com/slides/DesertCorp-Slide-Presentation.pdf). Productive Quantitative Easing will deliver economic progress without toxic effects of Financial QE. Productive QE is the non-toxic version of QE. It stops the value decline of currency based assets (destroying savings and pensions). It delivers strong backing by real economic output that is able directly (not vague indirectly) to amortize the investments made with it. The energy version of Productive QE is the most attractive version: EQE/EBS will stop their current strong increasing and continuous leaking wealth drain by foreign energy imports. Everybody happy. Improvement on all fronts. Productive QE does what the South/East European nations and central banks want (QE) in a north European way (real assets instead of paper asset backing). Mainly in the southern region of Europe governmental debt financing QE was before the introduction of the Euro always a part of the interaction between their governments and their central banks (the always existing inflation of the Lire is a good example). The introduction of the Euro made this long time existing tradition no longer possible, making the governmental debt funding international markets depending, which is a rocky road with third party instead of own rules. The southern nations just saw and see inflation not as a that big problem. In this they find the northern nations in a full/strong opposite position. 1) The North has a strong DNA selection based on those who survived severe winters and therefore are not that good in enjoying all the things of life (this is why the food in the South tastes so much better than in the North). In the South the winters where less hard and therefore national emotions are not that much shaped by preparing for the worst. 2) The North has as result of 1 more trust in institutions than the South (as the institutions of the North where mainly more conservative: needed to survive harsh winters). This resulted in a situation where in the North the wealth in captured in the financial system and in the South the wealth is captured mainly in personal real estate (high percentage of mortgage free houses). Combine those two and you know why the north and south think different on QE: they have different DNA and therefore also a different method of wealth storage. For the South the concept of currency is mainly a 'medium of exchange', while for the North it's also a 'storage of value'. As state above: The beauty of Productive QE is that it delivers that what the South want in a way the North likes. Productive QE is the glue between Northern and Southern vision/practices. If the banks want to secure their Basel Tier One demands while using Productive QE created money arrangements they could a) charge a signing fee or b) do the sales themselves (with the help of external partners) and harvest a part of the product margin themselves. Don't mix Productive QE with things like Fannie Mae (housing), Freddie Mac (housing) and Sallie Mae (student loans). Sallie Mae is not about physical investments and should not be explored for Productive QE for that reason (even is education a huge future asset for a nation: it can't been seen as collateral). Fannie Mae and Freddie Mac are focused on housing and where responsible for the housing bubble and therefore housing should not be a Productive QE target (although is other nations with no real estate bubble it could serve the economic development while maintaining monetary health). Productive QE is about a) additional conditions that prevents abuse and b) open database transparency: things Fannie Mae and Freddie Mac hadn't build-in that very well. Regardless the negative effects of Financial QE on the real economy: Financial QE will stay in place in those monetary regions of the world where the central banks are owned by a conglomerate of the banks and not by the government. In those regions where this is the case and the economies are declining all banks (all of them: not only the central bank owning) like Financial QE (better said: they need it like oxygen: as explained above). In those monetary regions Financial QE will stay in place for ever. For those with strong anti-corporatism arguments against QE in general: First: the practice of corporatism is a bad version/caricature version of fair capitalism: So your arguments are understandable and valid too. Special interests that maintain special governmental relations sole for the purpose of eating out the public interests by for only for them benefits/arrangements is not a good model. Second: But confusing anti-corporatism opinion with an anti-QE opinion is neglecting the difference between Financial QE and Productive QE. Productive QE never delivers/channels money directly to the financials. Financial QE is 'trickling down', Production QE isn't, Productive QE is 'percolating up'. Financials could only benefit of Productive QE by performance in the open market. So Productive QE delivers a fair playing field. Financial QE doesn't, on the contrary: Financial QE makes the playing field increasingly unfair. For those with strong anti-plan-economy arguments against QE in general. First: The concept of plan-economies have proven to be non-productive: So your arguments are understandable and valid too: The DDR (East Germany) for example was quite not an avatar of economic performance. Second: But confusing an anti-plan-economy opinion with an anti-QE opinion is neglecting the difference between a the concept of the plan-economy-model and Productive QE. In Productive QE only the direction is planned. An example of such a direction could be: 'we need to import less energy: stopping that monetary and wealth drain is in the interest of monetary and economic health'. The open market does the rest (within the build-in anti-fraud mechanisms). Of course all the Financial QE thirsty actors (governments and financials in dire straits caused by own malfunction) will continue in delivering very intensive media spin and political lobbying on the huge fictive general public benefits of Financial QE. Those two 'nothing is ever enough' actors (governments and financials) already eat out too much out of the economy/base they grow on, they should not be feed (and therefore grow) even more. But don't get fooled by this media spin, nor this political lobbying: Financial QE is not more and not less than just covering the today's consequences of the mistakes of the past with output of tomorrow, so that the mistakes will not come to surface yet. Financial QE is above all about no will to change the things that brought the problems, but just addressing the consequences and therefore it's about postponing needed changes as real solutions. Financial QE is mainly about creating more debt as solution for too big debt problems. Banks with too much non-performing assets that have brought them in dire straits should do some self assessment to find the causes of why they own this bad assets and modify their behaviour accordingly. Governments with too much debt that have brought them in dire straits should free themselves of the heavy/wide/massive influence of special interests that use/abuse them (as spenders of the public money both taxes and debt growth) as an easy accountless ATM. The Productive QE option is in all facets a better one, not only for the economy but also for the banks. Why? Productive QE delivers system sustainability (and that�s something banks like very much: the current system must go on). Only the Financial QE driven model is just not just sustainable: a) there�s a limit on wealth concentration (than the economic/social tensions become to intensive) and b) situations with mainly financial capitalism destroy the soil it grows on (it�s a model that corrects itself the hard way: it�s like fishing: when you fish too intensive the lake will deliver every day less fish). Productive QE takes care of more fish in the lake that can't be fished. Financial QE just exhaust the lake. This not avoidable market driven correction mechanism is why also the smart management of these by a conglomerate of banks owned and therefore excessive Financial QE practising central banks also will see cleary that much going further on the way of financial capitalism will drive them further away of the real wealth creation of productive capitalism. The smart governors among them will see that such an approach will deliver �1848� like events (http://en.wikipedia.org/wiki/Revolutions_of_1848). They will do like the smart sovereigns did that read the signs on the wall timely and survived by that back than: mixing their interests in a new ratio with the public interests. This is why even in monetary regions where the central banks are owned by a conglomerate of the banks will chose for Productive QE (but they will keep Financial QE also in place: that will be their demand to agree with Productive QE). Another reason will be that monetary regions that implement Productive QE will thrive severely and leave the only Financial QE implementing monetary regions quite behind them. To catch up with the economies of the Productive QE regions, the Financial QE regions will decide to implement Productive QE in their jurisdiction also. Only Financial QE without Productive QE will be seen as a scorched earth like/style strategy (http://en.wikipedia.org/wiki/Scorched_earth) no one want nor could benefit of. Harvesting in optimal/maximal setting is not about destroying the vineyard. Any farmer that doesn't have any kind of fertilizing approach will be confronted with lower harvests. This is something the financial industry at large (and therefore also those central banks that are owned by bank conglomerates too) will learn. To quote one of the dismantlers of LTCM (a financial bomb that almost detonated end of the 90ties) John Fullerton (http://en.wikipedia.org/wiki/John_B._Fullerton): �In the right context, such as the unprecedented need to finance the capital intensive energy system transformation, Qualitative easing should be considered as a complement to financial asset QE operations�. The only way for the Western World to save their financial system, their economies and their governmental budgets (all three hurt by economic decline) is to hedge their already done Financial QE operations in (strong in value declining i.e. value watering down) currency based assets with (stable in value) real (not financial paper based and in thereby somewhere in value rising realm) economic assets backed Productive QE operations. If the ECB will choose for the tool/method/practise/control of Productive QE, the trust of the world in both the European economy (thriving again, large growth or exports, etc), as the European currency (that more assets backed than ever instead of total absent of any assets backing fiat based one like the dollar) will surge as never before in the global monetary system. It would make the Euro (with all it's internal problems addressed by Productive QE as main tool to do/realize that) a serious competitor of for the total fiat dollar which is suffering any day more in an overstretched imperial governmental setting with declining foreign appetite for it. The USD will not be able to cope with this. Wallstreet is too much detached of Mainstreet that it will stay on the Financial QE way and only will flirt with Productive QE, but never will make Productive QE to the core of its strategy (and therefore never will have a by Productive QE generated full real assets backed currency).